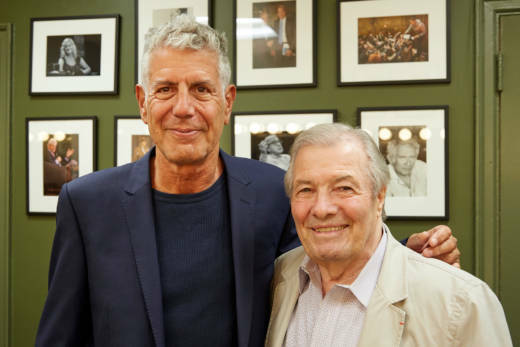 Jacques Pépin and Anthony Bourdain were friends for 25 years, each an internationally acclaimed chef, television personality, and author. Pépin, a longtime KQED contributor, was in many ways Bourdain’s role model, the authentic authority he aspired to be. 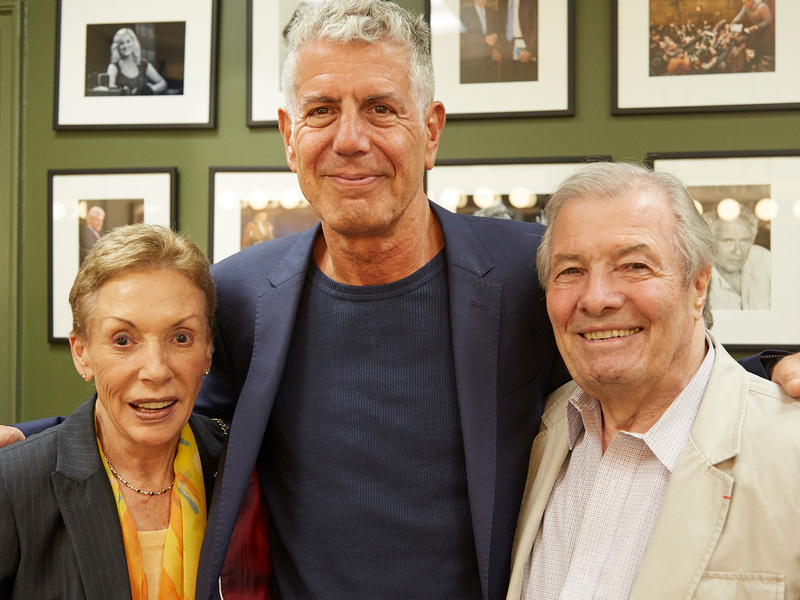 In this conversation with KQED Food’s executive producer Tina Salter, Jacques remembers Tony with affection and great respect for the enormous contribution he made to the intersecting worlds of food and culture. Tina: How did you first meet Anthony Bourdain? Jacques: It had to be nearly 25 years ago. He was chef at a restaurant called Brasserie Les Halles on Park Avenue in New York. One of the chefs that he worked with was a Spanish guy who studied at the first French Culinary Institute in New York, where I was teaching. He took me to meet Tony at Les Halles. Tina: Did you ever get a chance to work with him in the kitchen? Jacques: No, I never worked with him. We did events together and I know that in his book “Kitchen Confidential,” he said that I helped make him become what he became. Mostly, because I took him seriously and respected his writing about what really happens in the kitchen. People throwing out baskets of bread, for instance, bread that had been served but not eaten. Today, thanks in part to Tony speaking out, people are recycling that bread, and I am glad they do. I mean, my father would have killed me if I threw out a piece of bread. About three years ago, I did an event with Tony at the 92nd Street Y in New York. It was a big deal and was recorded for a podcast. He interviewed me in front of a crowd for an hour. I remember because my wife Gloria who never comes out for those kinds of things, joined us. She was determined to meet him. Tony was very generous and contributed to the American Masters PBS film about me, Jacques Pépin The Art of Craft. He was the kind of person you would send an email to and he would respond within the hour. The last time I heard from him was just a few weeks ago because I gave him one of my paintings. 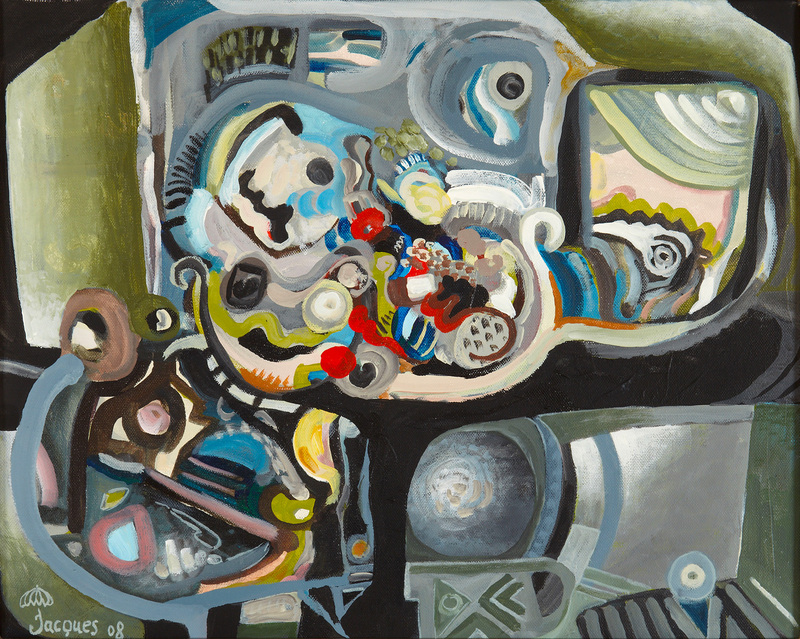 I decided that I would give paintings to everyone who had contributed to the film, from Tony to Fareed Zakaria. So I sent him a list with pictures of the paintings and told him to choose one. So he picked one that is called ‘Construction 1’. And he sent a thank you note, of course. Tina: What's the most memorable time that you spent with Tony? Jacques: Well, the most memorable was when he talked to me about the role of cooks in our world. He had been making the point about how for ages cooks had resided at the bottom of the social scale. And yet, today, in our time, that was changing, and we were becoming famous. We were now on par with the painters, and people in haute couture. His work and his words have been an important part of why that is happening. I guess the point is he was an extremely honest and genuine person with the courage to speak up. And he expressed his thanks to me for helping enable that in him. He certainly had no patience for fakery and false stuff. On his CNN show Parts Unknown he had this uncanny ability to sit down with some of the world’s greatest chefs, in Italy or France or in America. And at the same time discover women cooking behind small stoves in Libya, Vietnam or Mexico and elevate them to the same value and level. Watching his shows I would experience the culture of a country in a way I hadn’t known, in Vietnam or Lebanon or the Bronx. He revealed the food in such a way that it became a window into the people and their values and aspirations. And as we began to understand their food, we began to understand their culture. He did this by getting close to the people, truly talking and connecting with them, sharing culinary and other experiences. He was so much more than a reporter flying in for an interview. And yet when it came to interviewing he was excellent, very scrupulous and honest. Tina: He always gave credit to the workers in the kitchen, too. Jacques: Yeah, absolutely. Unpretentious and humble. I always repeat to people what he said to me: “I was never a great chef, I cook in the kitchen.” And, yes, there was always credit for the guys he worked with in the kitchen, in America, especially, he celebrated the work of the immigrants from Mexico and Central and South America. And at the same time he was friends with some of the greatest chefs from France. Eric Ripert, the chef-owner of Le Bernardin in New York, was one of Tony’s closest friends. Tony connected people in the culinary world to each other in a way that democratized cooking. I don't think anyone has done that as well. Tina: If you were sharing a meal with him, what would it be? Jacques: Oh boy. I tell you it would be very straightforward. Very good wine and I'm not talking about very expensive wine. Good wine, good beer, a lobster roll, a roast chicken, a salad. That's what he would like. Something simple, with taste.